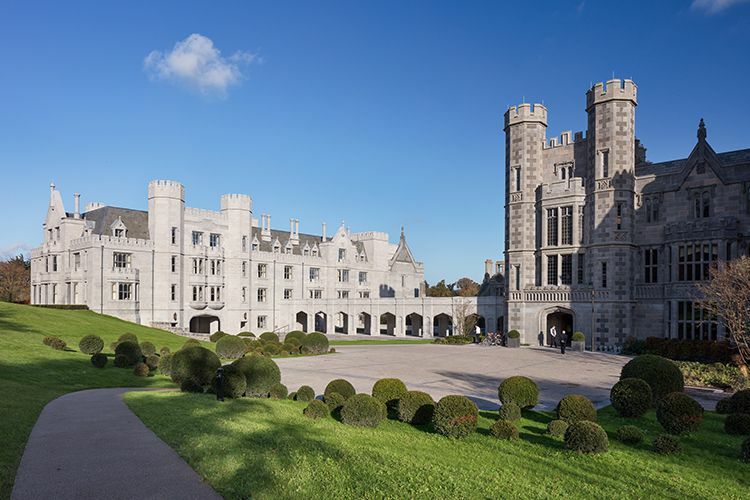 John Paul Construction’s meticulous restoration of the Adare Manor Hotel and Estate is one of the most prestigious and complex projects to be completed in Ireland in recent years. 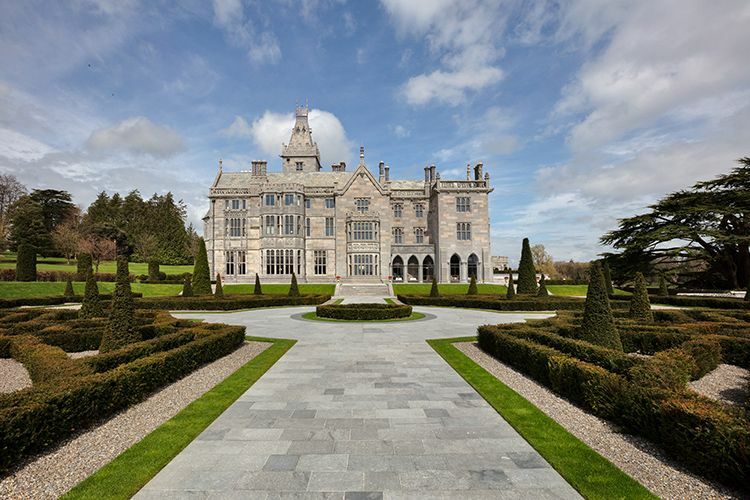 John Paul Construction’s restoration and remodelling of the Adare Manor Estate brought an estimated 750 workers to the picturesque area around the Co Limerick town of Adare. These people not only created a ‘thing of beauty’ on the Adare Manor Estate but also contributed to the local economy across the project duration. The completed hotel is officially recognised as one of the most prestigious in the world, and it now sits in the John Paul Construction project portfolio as an example of exemplary restoration work. The brief from the client called for a complete redevelopment and faithful restoration of the entire Adare Manor Estate. This entailed enhancing and future-proofing the existing 1832 building, as well as the addition of many exciting features to make it a spectacular and special destination. “To quote the poet John Keats, ‘A thing of beauty is a joy forever’. This sentiment reflected our collective brief and the approach taken to the project,” says Niall O’Connor, Contracts Manager, John Paul Construction. The project comprised the delicate restoration of the existing manor house, which included front of house spaces, such as The Great Hall, The Gallery, The Drawing Room and The Oak Room. The 23 existing signature suites were wholly transformed into a world-class standard. Existing back of house spaces were converted into a spectacular spa facility consisting of luxurious treatment rooms, a pool and a gymnasium. Exciting new features included the addition of 82 exquisite bedrooms and suites in a new west wing block. It also included a new conference and banqueting facility, a magnificent new ballroom, boardroom, cinema and many other modern amenities. The project also included ancillary buildings, with a new energy centre, facilities building, and golf clubhouse. All internal estate roads were upgraded. Hard and soft landscaping was completed across the estate, providing the same quality of finish externally as internally. “Both the original and new buildings have become a sequence of luxurious interconnecting spaces, which open onto formal gardens that, in turn, lead into mature parkland,” Niall explains . The project also included extensive conservation works, which included many intricate details that required the expertise of skilled traditional craftspeople. Works to the historic features of the 1830s manor house consisted of the complete restoration of the stone features, including the clock tower, gargoyles, parapets and mouldings, as well as over 50 carved stone chimney stacks, each with different ornamentation. 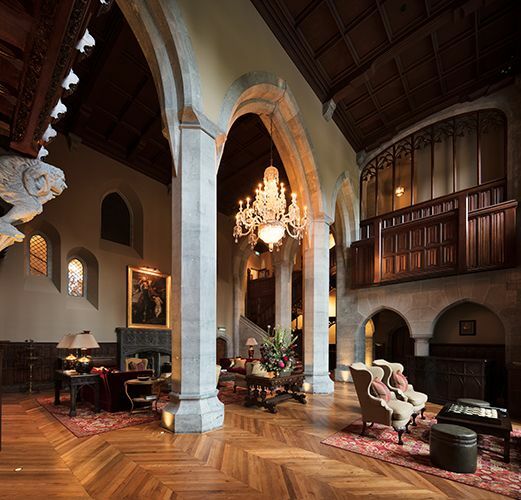 The original roof structure and towers are a significant part of the Adare Manor’s charm. However, they were in need of substantial repairs. To carry out this very delicate work the entire manor was wrapped with a weatherproof scaffold. This facilitated the opening-up of roofs during the winter period of 2017. 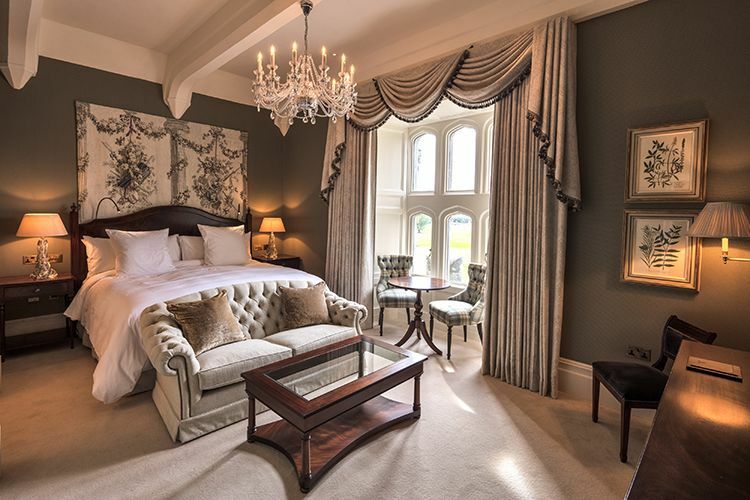 Adare Manor also has an array of window types, from a simple timber sliding sash to ornate stone frame windows, complete with lead-lined screens. One by one, the John Paul Construction team carefully repaired the framing and the glass as required. “We kept the original glass to reuse, wherever possible, and all the non-historic single panes were replaced with slimline double glazing,” Niall says. Perhaps the most delicate and impressive window conservation was the repair of The Gallery’s iconic stained-glass windows, which have been restored and now glisten with brilliant colour and renewed extravagance. Stone floors and walls were gently cleaned and restored to their original beauty. Fireplaces were repaired, and wherever an inlaid tile was missing, the team sourced matching tiles and seamlessly replaced the missing tile. 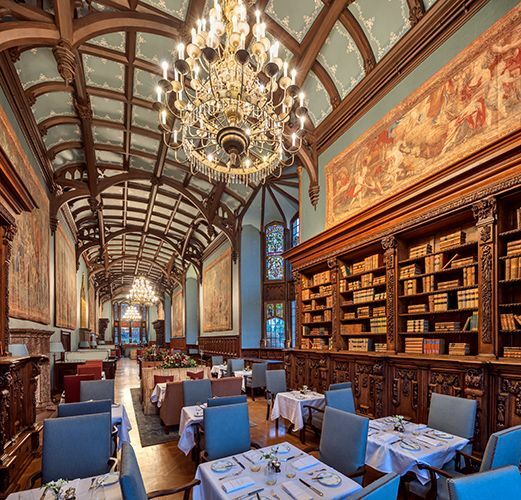 Original lime plastered walls and ceilings were repaired and augmented wherever required, then decorated using historically appropriate materials and finishes, including breathable paints, papers, and even gold-leaf. 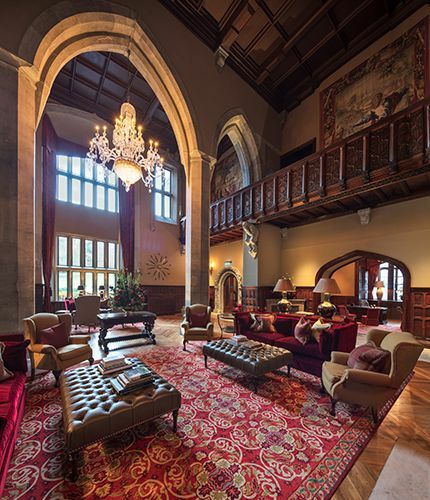 The Adare Manor redevelopment was an exceptional project for the conservation team at John Paul Construction to win. However, as would be expected the project came with many challenges, and overcoming these required a collaborative approach. “This extensive restoration required the sourcing of specialist and rare tradesmen, such as gold-leaf artists, handmade carpentry/joinery specialists, conservation leadwork craftspeople and window restoration experts, among many others,” he explains. The redevelopment project was a huge bonus to the village of Adare and the region. During construction, John Paul Construction employed a 750-strong workforce. People travelled from near and far to be part of the project. While accommodation seemed plentiful at the commencement of the project, this soon became a challenge. However, with the help of the client, accommodation was found for everyone. As already noted, the procurement of large quantities of raw materials, such as natural stone, marble, specialist joinery, and bronze, was a big challenge and at times could have been a logistical nightmare. “The ornate natural stone façade for the ballroom and colonnade was quarried in Co Roscommon, shipped to Fatima in Portugal for processing and final carving, and then shipped back to Adare for installation,” continues Niall. 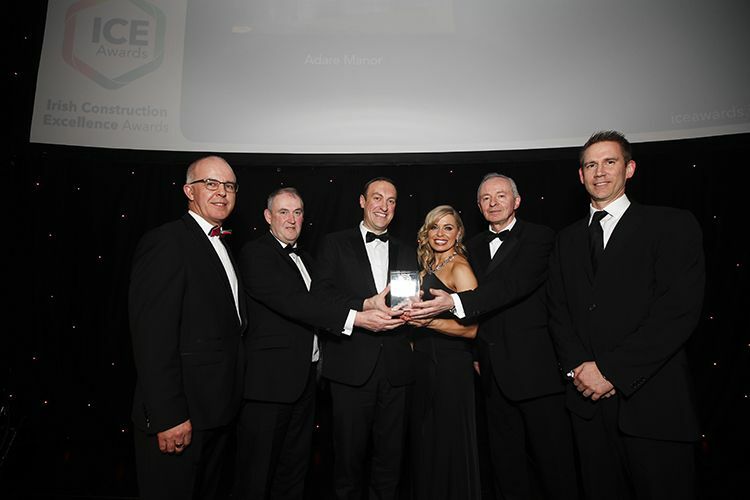 Since its completion, Adare Manor has won numerous important international awards including the ‘Tourism Project of the Year’ at the Irish Construction Excellence Awards 2018. 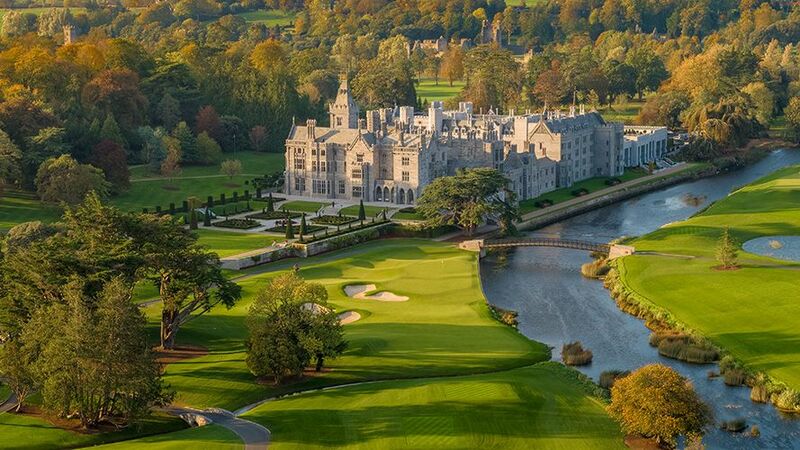 Adare Manor was also recently named the ‘World’s Best Hotel of the Year 2018’ at the prestigious Virtuoso Best of the Best Awards in Las Vegas. L to r: Donal Winters, John Kestell, Niall O’Connor, Anna Geary (MC), Eamon Booth and Darragh Canning. John Paul Construction strives to maintain a well-rounded portfolio of works, from commercial, industrial and data centres to healthcare and residential schemes to critical infrastructure. 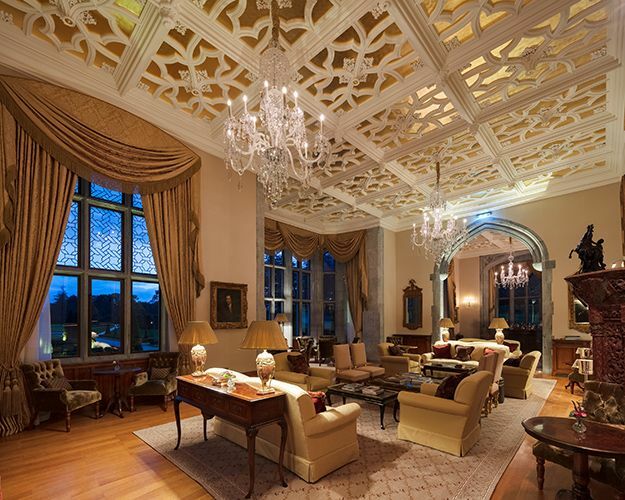 Although John Paul Construction has previous experience with both hotel and restoration works, the calibre of the Adare Manor project will possibly never again be matched. The successful completion of this project shows that John Paul Construction is capable of delivering the world’s Best of the Best.